- For over 20 years, Luminox has partnered with the world's toughest maritime commandos to continuously hone and refine a watch tough enough and useful enough to be considered first line gear for the finest warriors. In World War II, during the era of Frogmen and beach landings under fire, if a piece of diving gear wasn't on the ANU (Authorized for Navy Use) list, you didn't use it. The ANU list of equipment provided these Frogmen of the past and the Navy SEALs of today with a sense of security that their gear would work when needed. It is with this same intent that we name these newly developed watches, the ANU series. 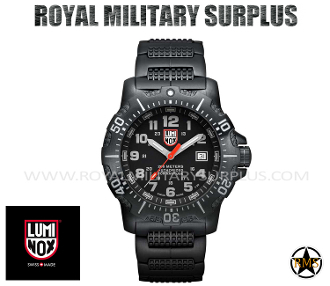 If you have an essential mission then use authorized essential gear, ANU by Luminox. - Luminox watches are Swiss Made and equipped with a unique self-powered illumination system. - The Luminox Navy SEAL watch is the timepiece that made Luminox famous. In 1993, the Assistant RDT&E Officer for the Navy SEALs, Nick North, was asked to seek a more dependable watch for night missions and found the solution when he discovered Luminox. He worked with Luminox to develop a watch to their specifications and a revolution was born. For over 20 years, Luminox has partnered with the world’s toughest maritime commandos to continuously hone and refine a watch tough enough and useful enough to be considered “first line gear” for the finest warriors. Today, we’ve taken the lessons of the past and the refinement capable in the present to develop our toughest and most specifically designed essential piece of timekeeping gear to date, the ANU (Authorized for Navy Use) watch series.